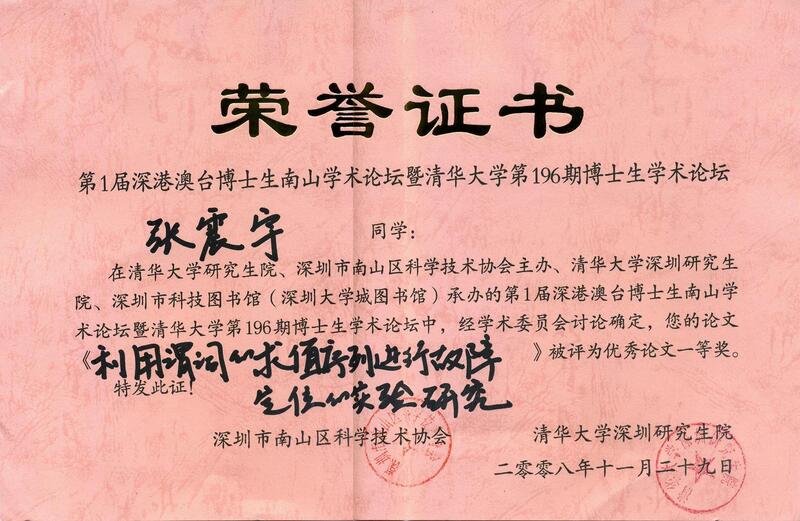 Jiang Bo, W.K. Chan, and Zhenyu Zhang, "A Systematic Study on Factors Impacting GUI Traversal-Based Test Case Generation Techniques for Android Applications", to appear in IEEE Transactions on Reliability (T-Rel), 2019. Long Zhang, Donghong Zhang, Chenghong Wang, Jing Zhao, and Zhenyu Zhang, "ART4SQLi: The ART of SQL Injuection Vulnerability Discovery", to appear in IEEE Transactions on Reliability (T-Rel), 2019. Yuzhen Liu, Long Zhang, and Zhenyu Zhang, "A Survey of Test Based Automatic Program Repair," Journal of Software (JSW) vol. 13, no. 8, pp. 437-452, 2018. C. M. Tang, W. K. Chan, Y. T. Yu, and Zhenyu Zhang, "Accuracy graphs of spectrum-based fault localization formulas", IEEE Transactions on Reliability (T-Rel), Volume: 66, Issue: 2, June 2017, pages 403-424. Yibiao Yang, Yuming Zhou, Hongmin Lu, Lin Chen, Zhenyu Chen, Baowen Xu, Hareton Leung, and Zhenyu Zhang, "Are slice-based cohesion metrics actually useful in effort-aware fault-proneness prediction? An empirical study", IEEE Transactions on Software Engineering (TSE) 41(4): 331-357 (2015). Lijun Mei, Yan Cai, Changjiang Jia, Bo Jiang, W.K. Chan, Zhenyu Zhang, and T.H. Tse, "A Subsumption Hierarchy of Test Case Prioritization for Composite Services", Transactions on Services Computing (TSC) 8(5): 658-673 (2015). Lei Zhao, Zhenyu Zhang, Lina Wang, and Xiaodan Yin, "A fault localization framework to alleviate the impact of execution similarity", International Journal of Software Engineering and Knowledge Engineering (IJSEKE) 23(7): 963-998 (2013). Zhenyu Zhang, W. K. Chan, T. H. Tse, and Peifeng Hu, "Experimental study to compare the use of metamorphic testing and assertion checking", Journal of Software (JoS) 20(10), 2009. Biyun Zhu, Ruijie Meng, Zhenyu Zhang and W.K. Chan, "ConRS: A Requests Scheduling Framework for Increasing Concurrency Degree of Server Programs", to appear in Proceedings of The 43rd IEEE International Conference on Computers, Software and Applications (COMPSAC 2019). Donghong Zhang, Zhenyu Zhang, Bo Jiang, and T.H. Tse, "The Impact of Lightweight Disassembler on Malware Detection: An Empirical Study", in Proceedings of The 42nd IEEE International Conference on Computers, Software and Applications (COMPSAC 2018), Tokyo, Japan, 2018, pp. 620-629. Bo Jiang, Yu Wu, Yongfei Zhang, Zhenyu Zhang, W.K. Chan, "ReTestDroid: Towards Safer Regression Test Selection for Android Application", in Proceedings of The 42nd IEEE International Conference on Computers, Software and Applications (COMPSAC 2018), Tokyo, Japan, 2018, pp. 235-244. Zijie Li, Lanfei Yan, Yuzhen Liu, Zhenyu Zhang, and Bo Jiang, "MURE: making use of MUtations to REfine spectrum-based fault localization", in Proceedings of The 18th IEEE International Conference on Software Quality, Reliability, and Security (QRS 2018), Lisbon, 2018, pp. 56-63. Bo Jiang, Yaoyue Zhang, W.K. Chan, and Zhenyu Zhang, "Which Factor Impacts GUI Traversal-Based Test Case Generation Technique Most? A Controlled Experiment on Android Applications", in Proceedings of The 2017 IEEE International Conference on Software Quality, Reliability & Security (QRS 2017). Chenglong Sun, Zhenyu Zhang, Bo Jiang, and W.K. Chan, "Facilitating Monkey Test by Detecting Operable Regions in Rendered GUI of Mobile Game Apps", in Proceedings of The 2016 IEEE International Conference on Software Quality, Reliability and Security (QRS 2016). Tian Huang, Zhenyu Zhang, and Xue-Yang Zhu, "Using Frame Rate to Analyze GUI Running Fluency for Android Apps", in Proceedings of The 3rd International Workshop on Mobile Sensing, Computing and Communication (MSCC 2016), in conjuction with The 17th ACM International Symposium on Mobile Ad Hoc Networking and Computing (MobiHoc 2016). 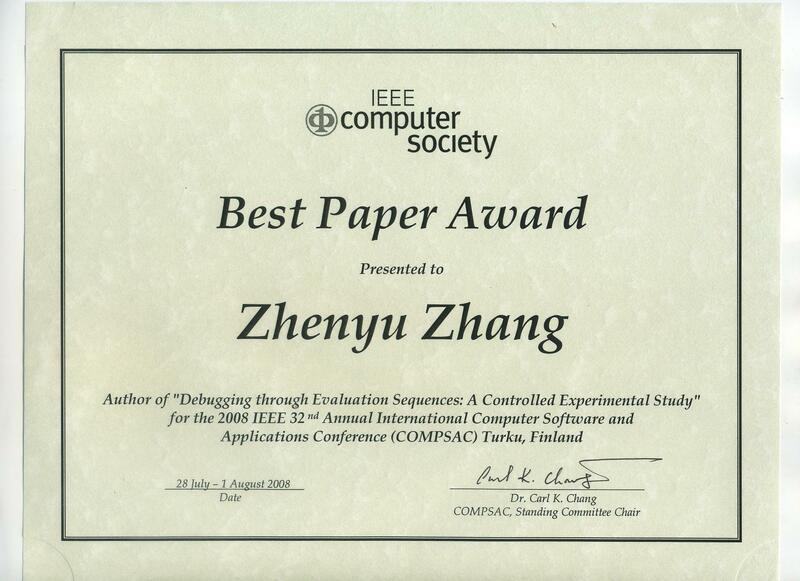 Fangyun Qin, Zheng Zheng, Chenggang Bai, Yu Qiao, Zhenyu Zhang, and Cheng Chen, "Cross-Project Aging Related Bug Prediction", in Proceedings of The 2015 IEEE International Conference on Software Quality, Reliability and Security (QRS 2015), pages 43-43 (2015). Chunlei Ma, Xiang Long, Bo Jiang, and Zhenyu Zhang, "Replay Debugging of Real-Time Vxworks Applications", in Proceedings of The 2015 International Workshop on Dependable Software and Applications (DSA 2015), in conjuction with The 39th Annual International Computers, Software & Applications Conference (COMPSAC), pages 568-573 (2015). Nan Wang, Zheng Zheng, Zhenyu Zhang, and Cheng Chen, "FLAVS: A Fault Localization Add-in for Visual Studio", in Proceedings of 1st International Workshop on COmplex faUlts and Failures in LargE Software Systems (COUFLESS 2015), in conjuction with The 37th International Conference on Software Engineering (ICSE 2015), pages 1-6 (2015). Chenghong Wang, Donghong Zhang, Hualin Lu, Jing Zhao, Zhenyu Zhang, and Zheng Zheng, "An experimental study on firewall performance: Dive into the bottleneck for firewall effectiveness", in Proceedings of 2014 10th International Conference on Information Assurance and Security (IAS 2014), Okinawa, 2014, pp. 71-76. Heng Li, Yuzhen liu, Zhenyu Zhang, and Jian Liu, "Program Structure Aware Fault Localization", in Proceedings of International Worshop on Inno- vative Software Development Methodologies and Practices (INNOSWDEV 2014), in conjunction with the 22nd ACM SIGSOFT International Sympo- sium on Foundations of Software Engineering (FSE 2014), pages 40-48 (2014). Yichao Gao, Zhenyu Zhang, Long Zhang, Cheng Gong, and Zheng Zheng, "A Theoretical Study: The Impact of Cloning Failed Test Cases on the Effectiveness of Fault Localization", in Proceedings of the Symposium on Engineering Test Harness 2013 (TSE-TH 2013), in conjunction with the 13th International Conference on Quality Software (QSIC 2013), pages 288-291 (2013). Zheng Zheng, Yichao Gao, Peng Hao, and Zhenyu Zhang, "Coincidental Correctness: an Interference or Interface to Successful Fault Localization? ", in Proceedings of The 4th IEEE International Workshop on Program Debugging (IWPD 2013), in conjunction with the The 24th IEEE International Symposium on Software Reliability Engineering (ISSRE 2013), Pasadena, CA, USA, Nov 4-7, 2013. Cheng Gong, Zheng Zheng, Zhenyu Zhang, Yunqian Zhang, and Yunzhi Xue, "Factorising the Multiple Fault Localization Problem", in Proceedings of The 19th Asia-Pacific Software Engineering Conference (APSEC 2012), Hong Kong, Dec 4 - 7, 2012. Chang-ai Sun, Yi Meng Zhai, Yan Shang, and Zhenyu Zhang, "Toward effectively locating integration-level faults in BPEL programs", in Proceedings of the 12th International Conference on Quality Software (QSIC 2012), Xi'an, China, Aug 27 - 29, 2012, pages 17-20. Lei Zhao, Zhenyu Zhang, Lina Wang, and Xiaodan Yin, "PAFL: Fault Localization via Noise Reduction on Coverage Vector", in Proceedings of the 23th International Conference on Software Engineering and Knowledge Engineering (SEKE 2011), Miami, USA, Jul 7 - 9, 2011. Zhenyu Zhang, Bo Jiang, W. K. Chan, and T. H. Tse, "Precise Propagation of Fault-Failure Correlations in Program Flow Graphs", in Proceedings of the 35th Annual IEEE International Computer Software and Applications Conference (COMPSAC 2011), Munich, Germany, Jul 18 - 22, 2011. Jian Xu, W. K. Chan, Zhenyu Zhang, and T. H. Tse, "A Dynamic Fault Localization Technique with Noise Reduction for Java Programs", in Proceedings of the 11th International Conference on Quality Software (QSIC 2011), Madrid, Spain, Jul 13 - 14, 2011. Zhenyu Zhang, Zhongxing Xu, Zhifang Liu, and Xiaopeng Gao, "Macro-like Instrumentation Grammar for Boolean Expressions", in Proceedings of 2010 International Conference on Computational Intelligence and Software Engineering (CiSE 2010), Wuhan, China, Dec 10 - 12, 2010. W. K. Chan, Lijun Mei, Zhenyu Zhang, and Xiaopeng Gao, "A community-centric model for service publication, discovery, selection, binding, and maintenance", in Proceedings of the 5th IEEE International Symposium on Service-Oriented System Engineering (SOSE 2010). Qiong Shi, Zhenyu Zhang, Zhifang Liu, and Xiaopeng Gao, "Enhance Fault Localization Using a 3D Surface Representation," in Proceedings of the 2nd International Conference on Computer Research and Development (ICCRD 2010), Kuala Lumpur, Malaysia, May 7 - 10, 2010, pages 720-724. W. K. Chan, Lijun Mei, and Zhenyu Zhang, "Modeling and testing of cloud applications", in Proceedings of 2009 IEEE Asia-Pacific Services Computing Conference (APSCC 2009), Singapore, December 7-11, 2009, IEEE Computer Society Press, Los Alamitos, CA, USA, 2009. Bo Jiang, Zhenyu Zhang, W. K. Chan, and T. H. Tse, "Adaptive random test case prioritization", in Proceedings of the 24th IEEE/ACM International Conference on Automated Software Engineering (ASE 2009), Auckland, New Zealand, November 2009. Zhenyu Zhang, W. K. Chan, T. H. Tse, Bo Jiang, and Xinming Wang, "Capturing propagation of infected program states", in Proceedings of the 7th joint meeting of the European Software Engineering Conference and the ACM SIGSOFT Symposium on the Foundations of Software Engineering (ESEC/FSE 2009) Aug 24 - 28, 2009, Amsterdam, The Netherlands. Xinming Wang, S.C. Cheung, W. K. Chan, and Zhenyu Zhang, "Taming coincidental correctness: coverage refinement with context patterns to improve fault localization", in Proceedings of the 31st International Conference on Software Engineering (ICSE 2009), Vancouver, Canada, May 2009. Peifeng Hu, Zhenyu Zhang, W. K. Chan, and T. H. Tse, "Fault localization with non-parametric program behavior model", in Proceedings of the 8th International Conference on Quality Software (QSIC 2008), Oxford, UK, Aug 12 - 13, 2008, IEEE Computer Society Press, Los Alamitos, California, 2008. Zhenyu Zhang, W. K. Chan, and T. H. Tse, "Synthesizing component-based WSN applications via automatic combination of code optimization techniques", in Proceedings of the 7th International Conference on Quality Software (QSIC 2007), Portland, Oregon, USA, Oct 11 - 12, 2007, pages 181-190, IEEE Computer Society Press, Los Alamitos, CA, USA, 2007. W. K. Chan, T.Y. Chen, S.C. Cheung, T. H. Tse, and Zhenyu Zhang, "Towards the testing of power-aware software applications for wireless sensor networks", in Proceedings of the 12th International Conference on Reliable Software Technologies (Ada-Europe 2007), Jun 25 - 29, 2007, Geneva, Switzerland, pages 84-99, LNCS 4498, Springer-Verlag, Berlin, 2007. Peifeng Hu, Zhenyu Zhang, W. K. Chan, and T. H. Tse, "An empirical comparison between direct and indirect test result checking approaches", in Proceedings of the 3rd International Workshop on Software Quality Assurance (SOQUA 2006), in conjunction with the 14th ACM SIGSOFT Symposium on Foundations of Software Engineering (FSE 2006), pages 6-13, ACM Press, New York, USA, 2006. Peng Hao, Zheng Zheng, Zhenyu Zhang, Yichao Gao, Cheng Gong, and Yunzhi Xue, "Self-Adaptive Fault Localization Algorithm Based on Predicate Execution Information Analysis", Chinese Journal of Computers, (in Chinese), 2014. Chaoqiang Deng, Fanping Zeng, Hui Zhang, Zhenyu Zhang, and Qixing Dong, "Detecting Program Non-crashing Failures via Assertion and Slicing", Journal of Chinese Computer Systems, (in Chinese), 2014. Tao He, Xinming Wang, Xiaocong Zhou, Wenjun Li, Zhenyu Zhang, and S. C. Cheung, "A Software Fault Localization Technique Based on Program Mutations", Chinese Journal of Computers, (in Chinese), 2013. Yunqian Zhang, Zheng Zheng, Xiaohui Ji, Wenbo Zhang, and Zhenyu Zhang, "Markov Model-based Effectiveness Predicting for Software Fault Localization", Chinese Journal of Computers, (in Chinese), 2013. Lei Zhao, Li-na Wang, Dongming Gao, Zhenyu Zhang, and Zuoting Xiong, "Mining Associations to Improve the Effectiveness of Fault Localization", Chinese Journal of Computers, (in Chinese), 2012. Zhenyu Zhang, "Software Debugging through Dynamic Analysis of Program Structures", The University of Hong Kong (2009). Best Paper Award. Jul, 2017. "Which Factor Impacts GUI Traversal-Based Test Case Generation Technique Most? A Controlled Experiment on Android Applications". The 2017 IEEE International Conference on Software Quality, Reliability & Security (QRS 2017), Prague, Czech. Best Paper Award. Jul, 2009. "How well do test case prioritization techniques support statistical fault localization". The 33nd Annual IEEE International Computer Software and Applications Conference (COMPSAC 2009), Seattle, WA. SIGSOFT-CAPS fund. Jul, 2009. "Capturing propagation of infectedprogram states". The ACM SIGSOFT Symposium on the Foundations of Software Engineering (FSE 2009). The ACM Special Interest Group on Software Engineering. Best Paper Award Nomination. Apr, 2009. "Test case prioritization for regression testing of service-oriented business applications". The 18th International World Wide Web Conference (WWW 2009), Madrid, Spain. Best Paper Award (First Class). Nov, 2008. "Debugging through Evaluation sequences: A Controlled Experimental Study". The 196th Tsinghua University PhD Candidates Academic Forum and the 3rd Tsinghua University Shenzhen Graduate School PhD Candidates Academic Forum, Shenzhen, China. Best Paper Award. Jul, 2008. "Debugging through evaluation sequences: a controlled experimental study". The 32nd Annual IEEE International Computer Software and Applications Conference (COMPSAC 2008), Turku, Finland. Best Paper Award. Jul, 2008. "Debugging through evaluation sequences: a controlled experimental study". IEEE Computer Society, 2008. MSRA Fellowship 2006 Nomination. May, 2006. Contributor of Gnome Email tool - Evolution. Aug, 2003 - Feb, 2004. Yunqian and Zhenyu Zhang, "Software fault localization by using Markov model", Chinese Patent, no. 201310308553.9. Zhenyu Zhang and Wenchao Gao, "Software fault localization by using evaluation sequence of Boolean expression", Chinese Patant, no. 201210002136.7. "Murphi Parser V1.0", (in Chinese), no. 2013SR0 85673. "Murphi Parser V2.0", (in Chinese). A regression testing tool built on Buildbot. It addresses multi-platform testing issues, especially for software like browsers, Web application, Instance Communication Tools, etc., that need to work in different platforms. A regression testing tool built on CruiseControl. It has common CI functionalities and the ability of test case prioritization and fault localization. It aims at reducing testing human work, debugging efforts, and development risks. Jan 2014 - Dec 2018. Safety Critical Systems Software Project Management and Quality Assurance. Jan 2014 - Dec 2014. Intelligent Instrument and Analysis for Continuous Delivery and Test Optimization. Jan 2014 - Dec 2017. Key technologies of parallel, multi-platform cloud-based testing. Jan, 2011 - Dec 2013. Regression testing and fault localization in a continuous integration environment. Jan 2010 - Dec 2012. Research on the application of automatic software fault localization. Jan 2010 - Dec 2011. Regression testing service equipped with fault localization mechanism. Dec, 2011 - Present. Associate Research Professor. State Key Laboratory of Computer Science, Institute of Software, Chinese Academy of Sciences, Beijing. Feb, 2010 - Nov 2011. Assistant Research Professor. Department of Comptuer Science, The University of Hong Kong, Hong Kong. Oct, 2005 - Sept, 2006. Teaching Assistant. Aug, 2003 - Feb, 2004. Software engineer. SUN China Engineering and Research Institute (SUN ERI), Beijing, China. Mar, 2003 - Jul, 2003. Visiting student. Visual Computing Group (VC), Microsoft Research Asia (MSRA), Beijing, China. Supervised by Dr. Harry Shum. Sept, 2002 - Jul, 2005. Intern. Computer and Information Management Center of Tsinghua University, Beijing, China. Supervisors: Prof. T. H. Tse and Dr. W. K. Chan. Department of Comptuer Science and Technology, Tsinghua University, Beijing, China. Last updated in Sep, 2016. @ Copyright 2010-2016, Zhenyu Zhang. All rights reserved.